Precision jaws allow you to snugly lock in on nuts and bolts. Tension spring stabilizer and smooth-moving knurl ensure first-rate adjustability. Masterful, best-of-both-worlds design provides maximum strength at a very low weight. 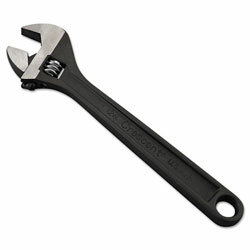 Wrench Type: Adjustable Angle-Head; SAE/Metric: SAE/Metric; Opening Size: 1 1/2"; 38mm; Opening Type: Adjustable. Adjustable Wrenches from Cooper Hand Tools! 34 In Stock today.